It appears Sidney Rice was simply determined to leave. How else do you explain why he’d sign with a team whose quarterback situation is far from settled and could very well have…Tarvaris Jackson starting when Leslie Fraizer made it clear he wanted Rice back and it was quite apparent that the Vikings were pursuing Donovan McNabb. Even though I’m not a huge fan of the McNabb move, I’d be a fool if I didn’t think McNabb wasn’t a huge improvement over Jackson. Jackson and Rice will reunite with Darrell Bevel in Seattle. Rice will sign a five-year contract that pays him $41, $18.5 million of which is guaranteed. The question now for the Vikings is who is our top receiver? 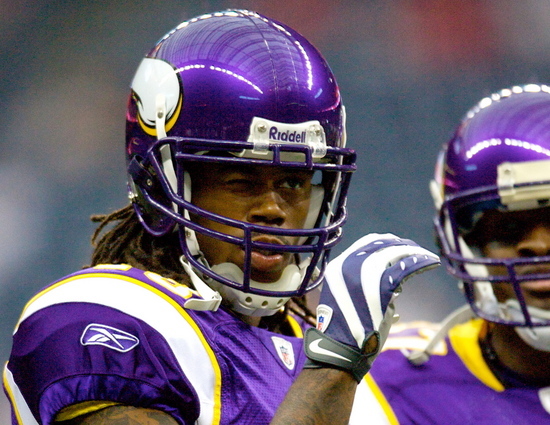 Will the Vikings stand pat with the lineup of Bernard Berrian, Percy Harvin, and Fill In The Blank? Will the Vikings employ a lot more two tight end sets with the addition of rookie Kyle Rudolph to the roster? Does the fact that Harvin dropped 10 pounds and presumably gained speed make him a candidate for the top spot? Will the Vikings pursue a free agent like Braylon Edwards? Here’s where I reconcile myself to the fact that the Vikings are going to sign Donovan McNabb, a quarterback I believe will make the transition to Christian Ponder more difficult. First, we didn’t give up much. A sixth rounder in 2012 and a conditional sixth rounder in 2013 and a vastly reduced contract is a pretty small price to pay for a quarterback who has had tremendous success in the past and could very well resurrect his career here in Minnesota. After the pathetic season he had in Washington, McNabb clearly has a lot to prove. He will have more talent to work with here than he did in DC. He’s got Adrian Peterson out of the backfield, Percy Harvin in the slot, and a pair of pass-catching tight ends in Visanthe Shiancoe and Kyle Rudolph. The offensive line, of course, is another question. Will McNabb’s vaunted mobility be tested or was last year’s poor line play largely a result of injuries? The StarTribune’s Mark Craig quotes former Viking quarterback Randall Cunningham making the point that quarterbacks don’t fully understand the game until their mid-thirties. It’s a good and valid point. McNabb is 34. Cunningham was 35 when he took us to the brink of a Super Bowl berth. Brett Favre was 40 when he had one of the best seasons of his career. So I can be hopeful that the McNabb move will work out. And now that it appears he’ll be our starting quarterback, I’ll be happy to get behind the move if only for the fact that asking Christian Ponder to start game one was always going to be a tall order. Thankfully, the Vikings signed Ryan Longwell to a four-year contract, keeping our kicking game stable and, with kickoffs being moved up five yards, solving a special teams weakness. If one of your favorite Vikings is NOT named Chris Kluwe, you just have no sense of humor. The Vikings punter, of course, wears number 5, the number that Donovan McNabb has worn throughout his career. So what does Kluwe want for the number? What’s his price? McNabb has to mention Kluwe’s band Tripping Icarus in at least five press conferences. McNabb also needs to make a donation to Kluwe’s favorite charity. …so what number does Kluwe want after he gives up number 5? He wants number 4 so all those Brett Favre jerseys can easily be converted to Kluwe jerseys.